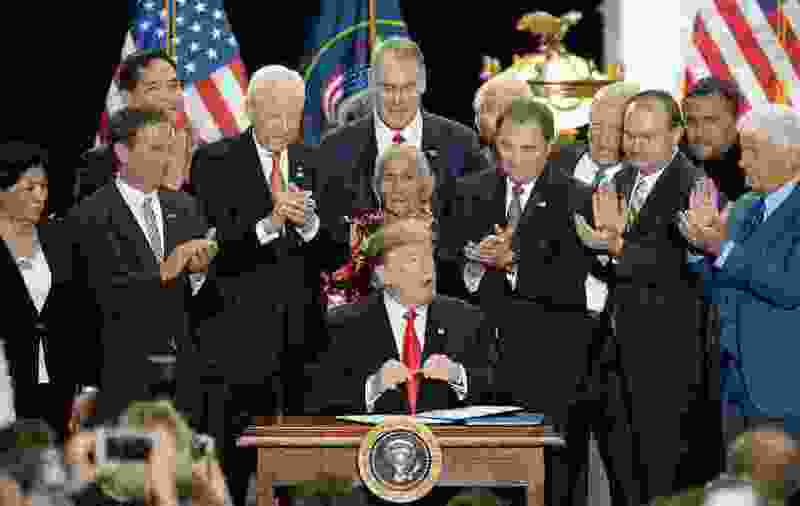 I would like to clear the air as to why you saw Native Americans standing alongside the Utah congressional delegation as President Trump signed the illegal proclamation gutting Bears Ears and Grand Staircase-Escalante national monuments. I have heard of many people unfamiliar with Native American tribes asking why Native Americans were there if the tribes were against the proclamation. The short answer is optics. This was a deliberate political ploy to create confusion and promote the falsehood that tribes are divided on the issue. The Native Americans on stage were the family and friends of San Juan County Commissioner Rebecca Benally. This is the same crew that has paraded in front of the cameras at every anti-monument public photo op for the last two years, including videos created and promoted by the anti-monument propaganda machine, the Sutherland Institute. Native Americans have differing opinions much like in any other community, and this deserves respect. Now when it comes to the Bears Ears, to whom should we listen? Well, that’s where tribal sovereignty guides us. Though some monument opponents are Native American, the sovereign tribes are the rightful representatives of their peoples, and they stand with Bears Ears National Monument. Tribal sovereignty is inherent to the existence of tribes. Since Europeans first encountered Native Americans, they didn’t make deals with individual Natives but the tribe as a whole. Historically, tribal sovereignty helped to create a buffer by which many tribes preserved their language, culture and identity. Native peoples have persisted despite systematic extermination through forced relocation, recurrent mass murder and indoctrination into the dominant culture by abusive boarding schools. We exist today largely in part by the hand of tribal sovereignty. The official voice belongs to the tribal leaders representing the tribe, and that’s the end of it. To undermine this is an attack on tribal sovereignty, tribal identity and Native people in general. Though we should acknowledge disagreement from some Native American families in San Juan County, the tribes have spoken on the Bears Ears. If you want to disagree with the tribes, that is fine; please state it as such. Ultimately, Benally and her clique are the hammer and chisel in the state’s efforts to chip away at tribal sovereignty. Weakened tribes make for easier manipulation and exploitation. The Indian Termination Act of the mid-20th century championed by a U.S. Senator from Utah serves as a great reminder. By attacking tribal sovereignty, they erode into the very existence of Native American tribes, and do irreparable damage to cultures struggling to survive. County Commissioner Benally has been formally chastised by the Navajo Nation for falsely claiming to speak for the Navajo people when she is not a tribal representative. She is a county official. If she was an elected leader of one of the Navajo chapter houses, then she could claim this fairly, but again, she works for the county. In Indian Country, with the history of individual tribal members sometimes betraying their tribes for a handout or payoff, she has become a pariah. Again, let it be clear that Native American tribes remain united in preserving Bears Ears National Monument in order to protect their shared ancestral homelands. Garon Coriz, M.D., Richfield, is a member of the Santo Domingo Pueblo Tribe.